Students at Oakland Unified School District in California who want to pursue careers in the medical field are participating in virtual medical internships as part of their high school curriculum. Oakland Unified follows a linked learning model, which means the school's academic curriculum includes a sequence of courses specific to the student's chosen future career. As part of the program, students participate in work-based learning experiences to help them develop real-world skills in their chosen field and put their classroom learning into context, and the district has partnered with local businesses, organizations and government to provide students with those experiences. The district offers 26 career pathways, several of which are for students who want to pursue careers in the field of health. While it's relatively easy to provide students with pre-internship readiness experiences in fields like the arts, media or entertainment, it's challenging to provide them in health career pathways because of issues with patient confidentiality and the hectic pace in hospitals. As a result, students and teachers are frustrated, and so are partners who provide student internships because those students don't arrive as well prepared as they're expected to be. The James Irvine Foundation provided the district with a grant to develop virtual medical internships using the Learnscape system from Toolwire, and leaders from the district worked with Toolwire to develop the computer-based simulations to prepare students for their actual internships. The teachers and staff in the district's health career pathways program are familiar with the typical scenarios that trip students up when they get out into the real world. They identified 12 career and technical education standards in the health field that students needed to master and mapped those internship scenarios to the learning standards. Toolwire's staff then took that information and used it to create virtual simulations of the scenarios in the Learnscape software. 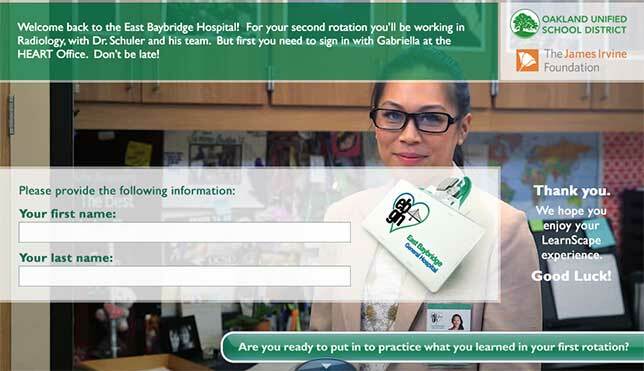 The virtual medical internship program consists of a series of three detailed scenarios designed to provide the students with experiences that will prepare them for real-world internships, and students in grades 10 through 12 work through the scenarios as part of their health career pathways classes. The first scenario is designed for beginners and models situations students might typically encounter on their first week at a busy hospital. "A big part of the first scenario was helping students understand those job readiness skills that they have to have, that when it says that they have a 2:00 start time for their internship, that doesn't mean start finding your way to the internship in that hospital at 2:00. That means reading a facilities map [and] finding out where you have to be and who you have to speak to," said Susan Benz, manager of College and Career Readiness for the district. "First-timers don't think of those things until they're lost in the hallway." The beginner scenario also includes a number of situational dilemmas. In one situation, the student is at an office for the first day with their intern host, who is a medical assistant. When the host says she has to leave for just a minute and goes off screen, the phone rings and the student has to decide whether or not to answer it. If the student says yes, they have to participate in a simulated dialog with the person on the other end, and they soon realize that maybe answering the phone wasn't such a great idea after all. "They are just these wonderful, constant, situational dilemmas where we set kids up and they respond in the Learnscape, and they get themselves into situations where they have to figure out, 'Oh, boy, how do I get out of this?' And it teaches them that, 'Oh, I'll never answer the phone again without permission or without having the information I need ahead of time,'" said Benz. The intermediate virtual medical internship scenario ramps up the level of challenge for students, and then the advanced scenario is very fast-paced and intense. It takes place in a hospital following an explosion, so the emergency room is inundated with patients. "It's a rising level of instruction in the three scenarios, and the last one is really fast and furious, so you better know your stuff and you better have your answers ready," said Benz. The students who participated in the pilot enjoyed working through the scenarios, according to Benz; and because they were virtual simulations, the students were able to make mistakes and learn from them without actually breaking HIPPA laws, breaching patient confidentiality or endangering anybody. "It's very self-paced, and it was fun for them," said Benz. "They also understood clearly that this is all real stuff that is going to happen to them on their worksite and they need to be ready for it." According to Benz, the teachers appreciated the virtual medical internships because their students' level of preparedness for their real-world internships reflects on them as teachers, and the virtual simulations were an easy way for teachers to give kids the experience they need. The district plans to continue using the virtual medical internships in its health career pathways, and Toolwire has made the software available to other school districts.